Frank Pavich's documentary on the widely speculated and discussed topic of Jodorowsky's planned version of Dune has a straightforward, linear narrative structure that assumes its audience knows nothing of the director nor the talent (most of whom went on to work on Alien) involved in the ambitious project. It's essentially a filmed book report, feigning artistic integrity by including some amateur animations of what Jodorowsky had storyboarded before the project fell through to make the subject worthy of a feature length documentary treatment. As a result, it follows a generalized, pre-existing documentary template, starting with a bit of foreshadowing before stepping back to the beginning where talking heads take an ironically traditional approach to telling the story of a deliberately untraditional man. Briefly discussing the insular nature of the Mexican film industry back in the '60s and '70s, the surrealist nature (described as a filmed acid trip) of Fando y Lis and El Topo are outlined—along with his spiritual ideology—providing some context about the man and his work leading up to the making of Holy Mountain. This film, given a million-dollar budget, served its time while, being abstract and controversial enough to appeal to a generation of people experimenting with moral limits and hallucinogenic drugs. Fuelled by ego and delusions of grandeur, Jodorowsky decided he wanted to make the sort of spiritual, otherworldly movie that would change the world. Without having read the book, he decided that he would make Dune, primarily because of its notoriety and cultural ubiquity. Amidst interviews with enthusiastic bloggers, pretentious directors (Nicolas Winding Refn, for example) and, most importantly, Jodorowsky himself, we learn about the limited commercial potential of Science Fiction pre-Star Wars and the audacious nature of the ideas being thrown out for this project. As the story progresses, the notorious director, a proponent of western esotericism, details how and why he chose the artists he did to collaborate with him. Some were famous musicians and artists (Pink Floyd, Mick Jagger and Salvador Dali to name a few), while others were mostly unknown pulp novel cover artists and graphic novelists. 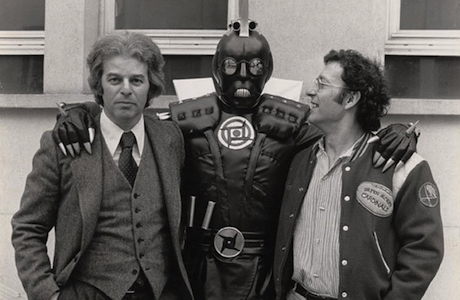 What's consistent about Jodorowsky's decision to work with people was their acquiescence to his ego or willingness to indulge his drug-addled whimsies. And while the basic story of how the elaborate storyboarded concept of Dune came to be is interesting, Pavich's overly hagiographic, populist approach to the material is as off-putting as it is insulting. Many problematic points arise—Jodorowsky's decision to put his son through mental and physical training to "become" Atreides (the product of an ovum and a castrated man's blood) for one—and are quickly dismissed for comic value. Though some of the interview subjects smirk when they recount some of Jodorowsky's more outlandish ideas, suggesting appreciation for a very passionate, very stoned, man, there's a sense of sanitized ego-stroking that makes it difficult to take any of it seriously. Essentially, Jodorowsky's Dune is all artifice: everything presented is either a fact or an assertion of the director's own ego. While there are some interesting observations made about the cultural landscape at the time and assertions about how the work done on this failed project influenced the direction that Science Fiction took in decades to come, there's nothing incisive, analytical or complex about the film. The cutesy veneer and tendency towards broad humour is understandable considering how involved Jodorowsky was with the documentary, giving Pavich exclusive interviews and insider information, but it doesn't make for overly compelling cinema. If anything, this is the sort of puff piece that would normally be included as a supplemental documentary on a Blu-ray had the movie actually been made.